I thought I'd break the outfit posts routine and do a different post today. This is something I've been wanting to do for a long time, but as you can imagine, it's not so easy with a toddler around. I knew posing with my baby girl would prove difficult so I kept postponing it. Turns out we got this done in less than 10 minutes and Rei was super cooperative. 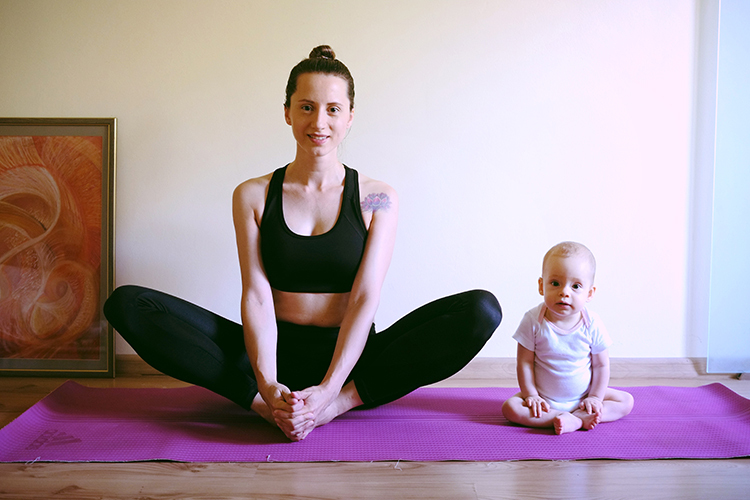 She's 7 and a half months old now, and I thought by now I would be able to practice yoga at least once a week and I would be back to my pre-pregnancy body. As you will notice in the photos below, it's not quite the case, but I am working on it. Finding time to practice yoga is the biggest challenge, so I try to do it when she is asleep or playing, but on the other hand that's also the time when I need to cook, clean the house, do laundry, eat, shower and the list can go on. It's still early, but I though it would be fun to include her in my practice. She will soon enough start to imitate me and maybe she will get the hang of it. So here are a couple of poses you can do with you baby. Sit down, bend your knees and press the soles of your feet together. Pull the heels towards your pelvis, exhale and drop the knees to the sides. You can either cross your fingers and hold your toes or you can grasp just the big toe of each foot. Straighten you back, inhale and bring your knees up, exhale and bring them back towards the floor. The up and down movement is what makes this similar to a butterfly flapping its wings. As you can see baby Rei is way better than me at this. Lie on your belly with your legs together and rest your forearms on the floor. The elbow should be right below the shoulder. Inhale and lift your head and upper torso up into a mild backbend. Your belly should not touch the floor. This will give a nice massage to your lower back and it also hels relieve stress. This is actually a variation of the plank pose, but I like it better because... well, because it's easier to maintain. You start in sphinx pose and you lift your body up and come on your toes. There should be a straight line from the top of your head to your heels. Maintain for at least 30 seconds and then go back to the sphinx pose and relax. Repeat a couple of times. This does wonders for the abdomen. As you can see, I still got a bit of excess skin and my abs are not as toned as they used to be, so I really need to do this more often. Place the baby underneath you for motivation, and she will love reaching out and playing with your your nose and lips. Sit on the floor, exhale and bend your knees, then lift your legs off the floor. The angle between your legs and thighs should be 90 degrees. Slowly raise your upper body up with your arms stretched alongside your legs. 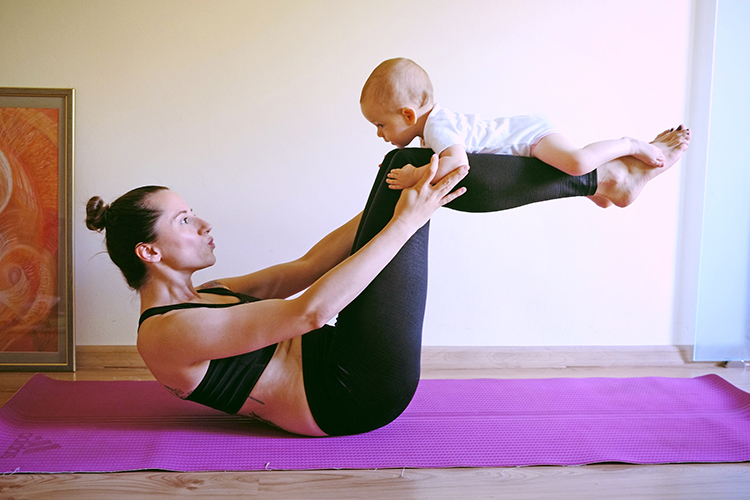 One way to include the baby in this posture is to use it as a counterweight, as I have, or you can place the baby on your belly. Careful not to lose your balance with this one, especially if the baby is squirmy. Lie down on your back, bend your knees and place both feet firmly on the mat. Bring the heels as close as possible to your buttocks. Place the baby on your belly, inhale and lift the buttocks as high as you can. Spread the legs a little bit and push the knees forward. Maintain the pose for at least 30 seconds, exhale and gently role the spine down on the floor. Amazing post! You both are beautiful and super cute. I should definitely try these with my baby, she's 7 and half months too!